Make two cuts in the shape of a cross in each of eight figs, plump them up a little so that they open up slightly, and fit them snuggly into a small ovenproof roasting tin or dish with a lid. 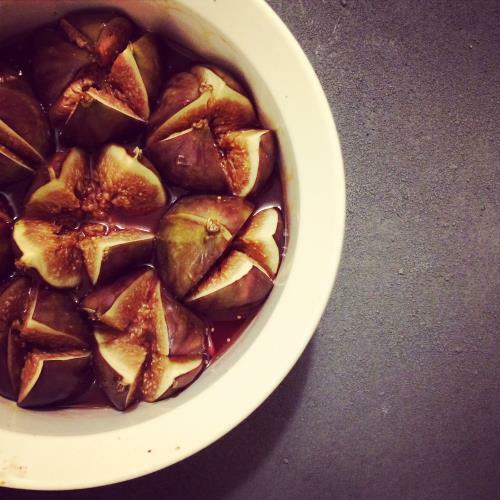 Drizzle a couple of tablespoons of honey over the top of the figs, letting plenty drip inside the cuts, and splash over a good glug of Marsala wine. Put the lid on the dish or tray and roast in the oven for about twenty minutes at 200c. Serve straight away, with vanilla ice cream, and some of the boozy sauce spooned over the top.